THE POWER OF THE BRAND IS SUVBVERSIVE BECAUSE IT IS ACTUALLY CHANGING THE VISION OF WHAT THE TOP IS - AND WHERE THE GOAL IS. VOODOO CHANEL IS THERE FOR YOU IN TIMES OF ECONOMIC DEPRIVATION TO SOCIALLY AND POLTICALLY STEP UP. VOODOOC CHANEL SHOWS YOU THAT JUST PAYING FOR A BRAND AND WEARING IT LOOKS LIKE A SOCIAL FAILURE YOU´RE COVERING UP. VOODOO CHANEL TAKING THE GLAM OF A BRAND AND THE MARKET POWER THAT ALREADY EXISTS AROUND IT ADDING THE PERSONAL AND SUBERSIVE ENERGY CONNECTED MORE TO THE ACTUAL PRODUCERS OF THE PRODUCT . 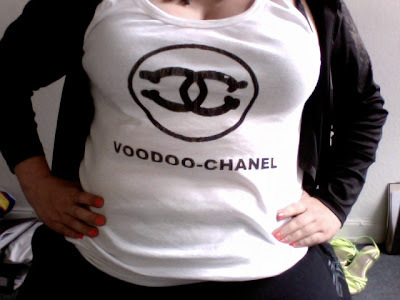 VOODOO CHANEL IS STEALING CHANEL FROM THE CORPORATE OFFICES IN PARIS, LONDON, NEW YORK. VOODOO CHANEL DID A BIG FAVOUR TO CHANEL BY ADDING LIFE TO THE DUSTY FLAVOUR OF DECADENCE. VOODOO CHANEL DISCREDITS OTHER WAYS OF STEPPING UP THE LADDER OF IMPORTANCE AND POWER BY PAYING LOW PRiCES FOR THE COUNTERFIT MADE-IN-CHINA-LUIS-VUITTON-HERMÉ-BAGS, BECAUSE BY THIS YOU ARE SUPPORTING THE SYSTEM OF KEEPING THE POOR POOR AND THE RICH RICH. VOODOO CHANEL IS A COLLECTIVE WORK, THE SHIPPING IS A JPEG. VOODOO CHANEL SAYS: UPGRADE YOURSELF TO FIRST CLASS AND DONT FORGET THE MAGIC POWDER.